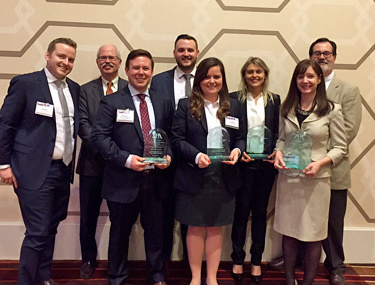 Northwestern Pritzker School of Law students took home the top prizes at the American Bar Association’s (ABA) 15th Annual Law Student Tax Challenge at the ABA’s Section of Taxation 2016 Midyear Meeting in Los Angeles. Janelle Darnell (LLM Tax ‘16) and Ester Santana (LLM Tax ‘16), coached by Professor Robert Wootton, won first place for their oral presentation. Samuel Neece (LLM Tax ‘16) and Colleen Redden (LLM Tax ‘16), coached by Professor Jeffrey Sheffield, came in second in the same competition. James Baker (LLM Tax ‘16) and Daniel Wharton (LLM Tax ‘16), also coached by Sheffield, won best written submission. The challenge is designed to give students an opportunity to research, write about, and present their analyses of a real-life tax planning problem. There is both a JD and LLM division. Over the past nine years, Northwestern Law’s LLM Tax teams won first place in the LLM division six times and won Best Written Submission four times.